RAE's New Graco® Plural Component 1:1 Striper - professionally modified to spray two component 1:1 MMA or epoxy paint materials. 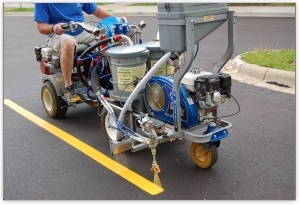 Plural Component Modified Graco® Line Striper and Roadzilla® Methyl Methacrylate (MMA) Combined for Easy Installation of the World's Toughest Marking Paint! "One of the World's Toughest Road Marking Systems!" MMA's long lasting performance has been proven with its more than 20 years of use worldwide. It has been road-tested and performance proven in Canada, England, France, Switzerland, Denmark and Germany, as well as on some of the toughest roads in America. Roadzilla® outperforms other marking systems hands down, and significantly improves visibility and motorist safety.